Have Your Very Own Rodeo! Description: We offer the ultimate adventure for your corporate, college, church, and night club or school event in the low country area. Your Bar, Corporate, or Church event should not be without our new Mechanical bull. We are available throughout a large area for entertaining you and your guests. You will always remember your first ride on the bull as it twists and turns all the while knowing that an inflatable surface is there if you fail to tame the beast. We always have safety in mind and can set our automatic ride settings for the kids too! We are available for your college event, Bar, after prom party, lock in, night clubs, carnivals, corporate events, trade shows, conventions and more. The rental is fully staffed by our trained rodeo staff.. A great addition to many other entertainment items. 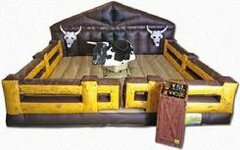 Our mechanical bull will be fully staffed and provide the latest safety items that the mechanical bull industry has to offer. All riders will be required to sign a waiver before they ride. We require a 25 ft. by 25 ft. area and two (2) dedicated true 20 amp circuits within 50 ft. You MUST verify that the circuits have NOTHING else running on them as we are not be responsible for inadequate electrical systems at your event location. We can provide our own power if needed for outdoor events at extra cost.